The first IFBB contest ever held was Dan Lurie's Mr New York State, held January 15, 1948 at the Brooklyn Academy of Music. Joe and Ben Weider had nothing to do with that contest. Previous contests promoted by Dan had been sanctioned by the AAU, but when the AAU refused to sanction the 1948 contest, Dan came up with the name International Federation of Body Builders in May of 1947 and registered it with the city of New York. The IFBB website claims the IFBB was formed in 1946. Yet an article in Joe Weider's Your Physique magazine proposes the formation of the IFBB in December 1947. Ben Weider held a show in Canada on October 10, 1947 but no where on the flyers for that show does the name IFBB appear. 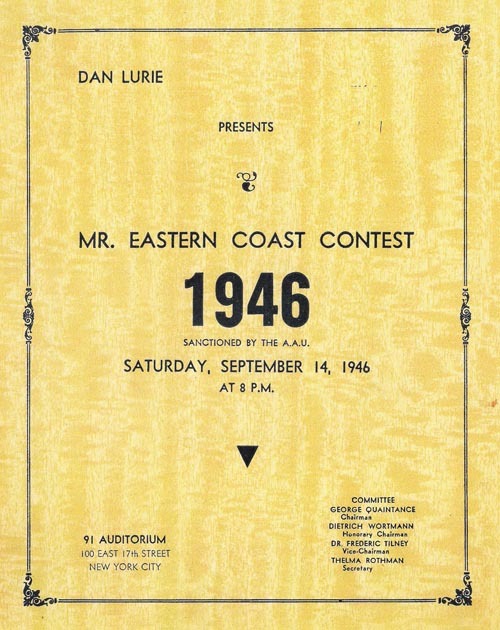 The June, 1948 Your Physique announces the first IFBB contest was to be the Mr. Eastern North America on May 28, 1948. A search (pdf) of Canadian records show the IFBB was incorporated on December 30, 1969. The I.F.B.B. and the A.A.U.